A tactical FPS is coming exclusively to PlayStation VR and attendees at PSX get a taste for the first time. The first original game teased at PSX 2017 is a tactical shooter exclusive to the PlayStation VR. It's an attack and defense strategic shooter in the vein of Siege or Counter-Strike. Matches will be four vs four and players will be able to use a DualShock controller or the PS Aim for the game. 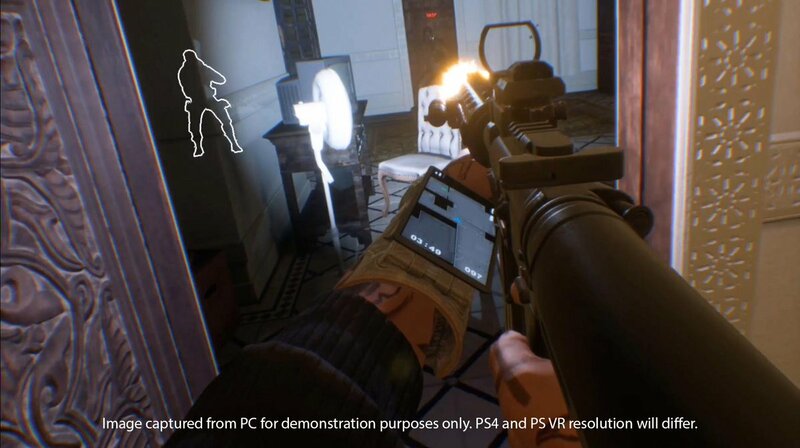 "In Firewall Zero Hour, two teams of mercenaries are hired by anonymous contract handlers to either protect or obtain highly sensitive information on a laptop in dangerous and exotic locations around the globe. Each team’s anonymous contract handler acts as their “eye in the sky” and guides each match by providing objectives and critical mission information along the way. Their only concern is the data and they are willing to pay you handsomely for it. Each team accomplishes these objectives through highly-coordinated teamwork with an arsenal of modern weapons and offensive/defensive equipment to help their team and hinder the other. Players are rewarded in-game with cryptocurrency and experience points upon the successful completion of contracts/matches and can use those currencies to upgrade contractors, weapons, equipment, load-outs and cosmetic customization."